The scandal of this collection lies not just in its equating law and resistance but also in its consequent revision of those critical, realist, social, and even positivist theories that would constitute law in its dependence on sovereign or society, on some surpassing power, or on the state of the judge's digestion. There is as well a further provocation offered by the collection in that the most marginalized of resistances through law are found to be the most destabilizing of standard paradigms of legal authority. Instances of such seeming marginality explored here include the resistances of colonized and indigenous peoples and resistance pursued through international law. What this 'marginal' focus also reveals is the constituent connection between modernism, imperialism and that legalism produced by the ready reduction of law in terms of sovereign, society and such. In all, the collection makes a radical contribution to social, political and postcolonial theories of law. Contents: Introduction; Interview; 'In God we trust' can relieve us of trusting each other; 'The desperate vacuum': imperialism and law in the experience of enlightenment; Law as resistance; Law's infamy; 'We know what it is when you do not ask us': nationalism as racism; Tears of the law: colonial resistance and legal determination; Why the law is also nonviolent; 'No higher duty': Mabo and the failure of legal foundation; 'Gods would be needed…': American empire and the rule of (international) law; Breaking the unity of the world: savage sources and feminine law; The immanence of Empire; Bare sovereignty: homo sacer and the insistence of law; Latin roots: imperialism and the formation of modern law; 'What are gods to us now? ': secular theology and the modernity of law; Name index. 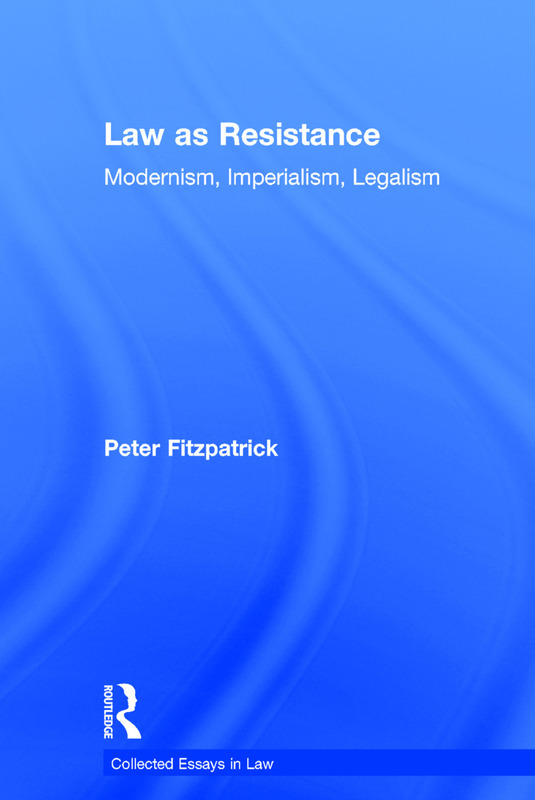 Peter Fitzpatrick is Anniversary Professor of Law at Birkbeck College in the University of London, UK.